“I’ve been a model for the last 15 years…” At least that’s what Andrea Leis use to tell people. As a joke, she would say “I’m a model – a before photo in those late night weight loss commercials.” Andrea wasn’t always overweight. Before she went to college she was 5’9”, 130 pounds and in great shape. After the first year of college, she packed on the infamous Freshman 15, but little did Andrea know that was just the beginning of a lifelong “battle of the bulge”. After college Andrea landed a “real job” which consisted of working 8 hours per day, in an office and in front of a computer screen. With a couple of years of eating out more than dining in, and not to mention bar hopping with her girlfriends, Andrea was up to 155 pounds. The same weight when she met her future husband, Dennis Leis. The next 5 years were a whirlwind. Dennis and Andrea started their own business, bought a house, expanded their business, moved into a new house, got engaged and then married, and expanded their business for the third time. Needless to say, the Leis couple worked hard and played even harder. Life had been great to them. They were in love, successful and in their free time they traveled, enjoyed food and drank. Life was good. At this time in Andrea’s life, she was at her heaviest weighing in at 165 pounds, and her husband Dennis was up to 240 pounds – 30 more pounds than when they first met. Life wasn’t about to slow down for the couple. In October of 2009, their son was born and then 16 months later Andrea gave birth to twin girls. Andrea felt very blessed that her husband Dennis was so supportive during both pregnancies. Dennis didn’t want Andrea to feel alone in the process, so he even went to the extent to put on sympathy weight. Balancing 3 children in diapers, their business and marriage left the couple limited time to focus on themselves. Even with all of this, Dennis and Andrea didn’t let the chaos stop them from wanting to live healthier lives. They tried everything to get healthy and lose weight. They joined a gym – went twice and never returned. Then they tried workout DVDs. One after another came in the mail only to be left unopened. They did the whole “let’s work out at home” thing and bought the equipment, dusted it off every few weeks, and wondered why they weren’t losing weight. They even went as far as hiring a personal trainer to come to their home to whip them into shape. As expected, everything worked for the first couple of weeks, but then they would plateau. They tried a ton of fad diets one after another – one where they ate only meat, another where they ate only vegetables. They both became so frustrated that nothing was working, they were fed-up with trying. By the end of 2013, Dennis was up to 255 pounds and Andrea was, let’s just say “at her heaviest”. Dennis made the decision one day that he had enough. While sitting on the couch watching TV, it just hit him. He loves their kids so much and wants to be around to see them grow up and grow old. The only way he and Andrea were going to do that, is if they were as healthy as possible. Dennis got online and tried to find something new and different than what they had tried (and failed at) in the past. He came across a TEDx Talk from Transformation Specialist Angelo Poli about technology's impact on our posture. Dennis was so intrigued by Poli’s talk that he started doing more research about Poli and his expertise. He came across a diet process that Poli founded called Metabolic Profiling (MetPro). MetPro analyzes a person’s specific response to diet and activity and makes adjustments to their individualized diet strategy based on their personal needs and goals. Dennis next came to a page that showed hundreds of weight loss transformations. Not only of athletes, and models, but businessman and women just like himself and Andrea. Each of them with the same goal – to become the best version of themselves. Dennis and Andrea tried everything, and at this point, they were desperate for something different. Dennis immediately scheduled a consultation through MetPro’s online system. The next day he had a great conversation with one of MetPro’s coaches, a call which lasted over 30 minutes. His coach Joel explained how MetPro’s process worked and walked him through, step-by-step, exactly what he was going to do to help him and his wife turn their lives around. The next week was pretty intense. Dennis and Andrea were set up with the MetPro App and took a series of tests and evaluations. 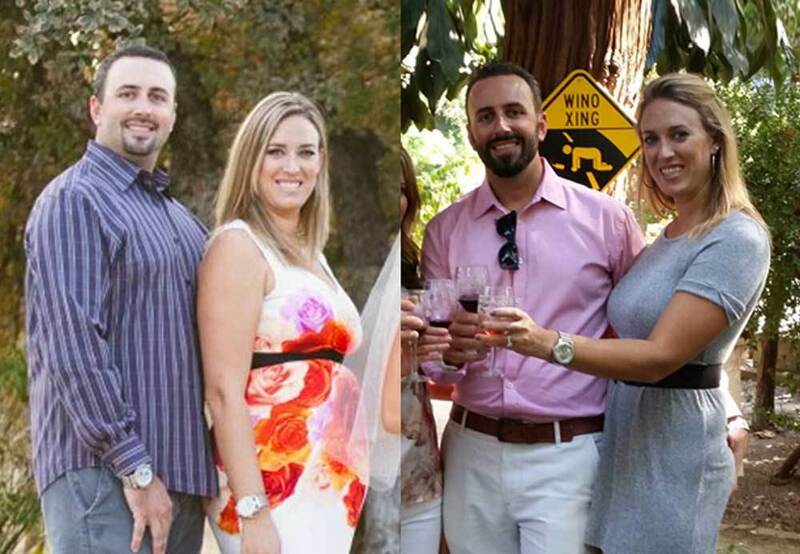 This data helped their coaches understand their current metabolism, and scientifically calculated a diet strategy that would best meet both Dennis and Andrea’s lifestyle and goals. In the first week, Andrea lost 4 pounds and Dennis lost 6 pounds. The couple was ecstatic but hesitant as well since with most diets the first few pounds usually aren’t that hard to lose. Their coaches worked with Dennis and Andrea separately to ensure that they both received the individualized treatment they needed. Their diets were monitored daily through MetPro’s app, and adjusted based on their results. Unlike other one-size-fits-all diets, MetPro was truly customized and adjusted to Andrea and Dennis’ work and travel schedules, metabolisms, and their dietary needs. Throughout the whole process, both Dennis and Andrea felt that their goals were always top of mind. This process allowed Dennis and Andrea to lose the weight steadily. Even when they hit a plateau their MetPro coaches had a creative approach to keep them moving. “The best part about MetPro was that we were eating regular food that we bought from our grocery store – no shakes or pills, and we both felt amazing!” said, Dennis. Over the next few months that followed, the weight kept coming off. Dennis and Andrea had more energy, their clothes fitted better, and their family and friends started to take notice. “Having a personal nutrition coach guide us through the process is what made the difference. We not only transformed our bodies, but we also transformed our lives. Our kids love the new versions of us. We still travel a lot and go out to dinner often, but the weight keeps coming off now that we have the knowledge to keep our metabolism in gear.” said Dennis. Dennis and Andrea can’t thank Angelo and his team of experts enough for creating such a revolutionary approach. They owe all of their newly found knowledge and success to the MetPro team. Dennis and Andrea consistently recommend MetPro to both their colleagues, family members, and friends who are serious about transforming their lives.